What can I use my Sephora gift card for? You can use your Sephora eGift Card to purchase beauty products at Sephora.com, in the Sephora Mobile App, at U.S. & Canada Sephora Stores and Sephora inside JCPenny Stores. Use your gift card in store as well as online. Please note that you can’t use your gift card to buy other gift cards. What kind of account do I need to redeem my Sephora gift card? You do not need any kind of account to redeem your Sephora eGift Card. How can I redeem my Sephora gift code? To redeem your Sephora eGift Card, please click on the ‘Claim’ site link and enter the Secret Code into their website. After completing the redemption process, you will be presented with a printable Sephora gift card valid for use in store or at their website at www.sephora.com. Show your gift card to the cashier at any Sephora store in the U.S. and Canada. These Sephora Gift Cards allow you to pay for products from Sephora, online and in offline shops. On this page, you can choose the value of the Gift Card for Sephora. These Sephora Gift Cards are mostly used by people who want to give an online gift to someone else or themselves. People who want a different way of paying for their Sephora products. Got a case of the hmm’s? Not anymore. The Sephora eGift Card solves your every gift-giving indecision. The card can be redeemed in store, online, or through any of our catalogs. What’s more, it doesn’t expire, and both the balance and transaction history can be checked online or in any Sephora store. 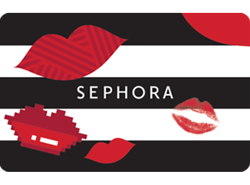 Purchase, use or acceptance of this eGift Card constitutes acceptance of the following terms: eGift Cards are redeemable only for merchandise sold in U.S. Sephora stores, on Sephora.com for U.S. orders only, through the U.S. Sephora App, or at Sephora inside JCPenney stores. eGift Cards are not redeemable or exchangeable for cash (except as required by law). This eGift Card does not expire and is valid until redeemed, and no fees will be charged against the unused balance. You may not add value to an eGift Card. The value of this eGift Card will not be replaced if the card is lost, stolen, altered or destroyed. Treat this card as cash. If your purchase exceeds the unused balance of the eGift Card, you must pay the excess at the time of purchase. If your purchase is less than the balance of the card, the difference will be available to you for future redemption. This eGift Card is issued by LGCS Inc., a Florida corporation, which is the sole legal obligor to the cardholder. Neither Sephora USA, Inc. nor any of its subsidiaries or affiliates other than LGCS Inc. shall be liable to the cardholder with respect to the card. You may purchase an eGift Card for your own use or as a gift for another person. All sales of eGift Cards are non-refundable and final. For complete terms and conditions (including arbitration agreement and class action waiver), which are subject to change, please visit www.sephora.com/giftcards. For Sephora store locations, to order, or for card balance, please visit Sephora.com or call 1-888- 860-7897. © 2016 LGCS Inc. All rights reserved. *Sephora is not a sponsor of this promotion or otherwise affiliated with this company. The logos and other identifying marks attached are trademarks of and owned by each represented company and/or its affiliates. Please visit each company’s website for additional terms and conditions.